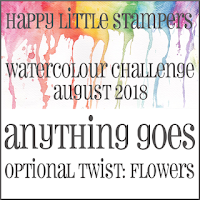 Wow - It's already August - halfway through the summer - and also time for a new CAS Mix Up challenge! Nancy is our host this month and her challenge is Stencil Monoprint! And if you don't quite know what that is - check out the blog where there are several links to YouTube videos showing ways to use this technique! I checked out this video by Shelby Thomas that is posted over at the CAS Mix Up blog and created my card in a similar fashion. 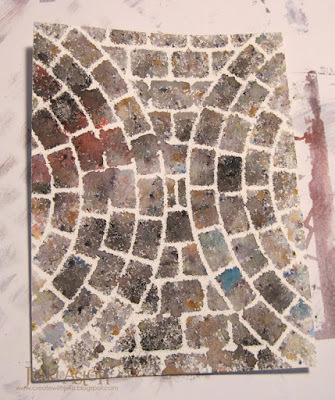 I ended up with red brick with grey grout using this technique! 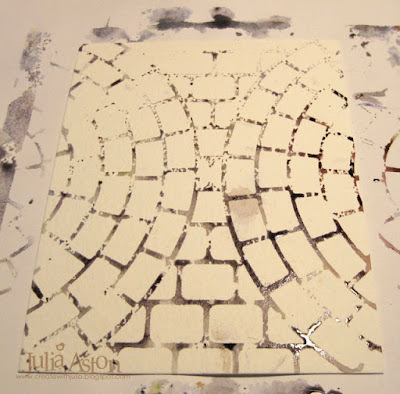 I used Brushos on my Intersecting Bricks stencil twice - a postive and a negative print of the stencil - and before you get confused - I've got several photos to show you the process I used to end up with this monoprint! So, oddly enough I started out with Grey Brusho, sprinkling it over the stencil onto the watercolor card panel under the stencil. I spritzed with water to activate the Brusho Powder. 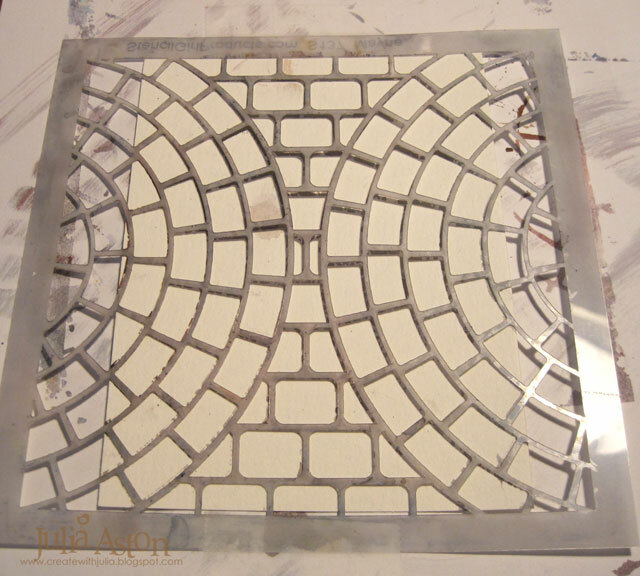 Then I removed stencil and you see this result below. 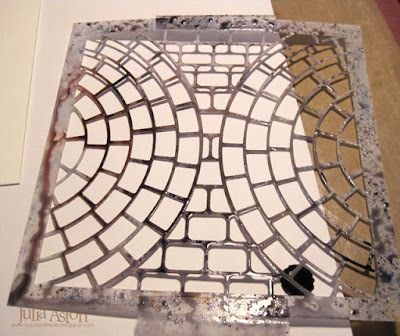 Put this panel safely aside as you move on to make a negative print. 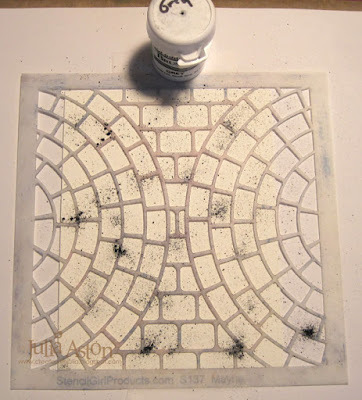 You'll see lots of watery paint on the stencil that you just used to make the grey print. 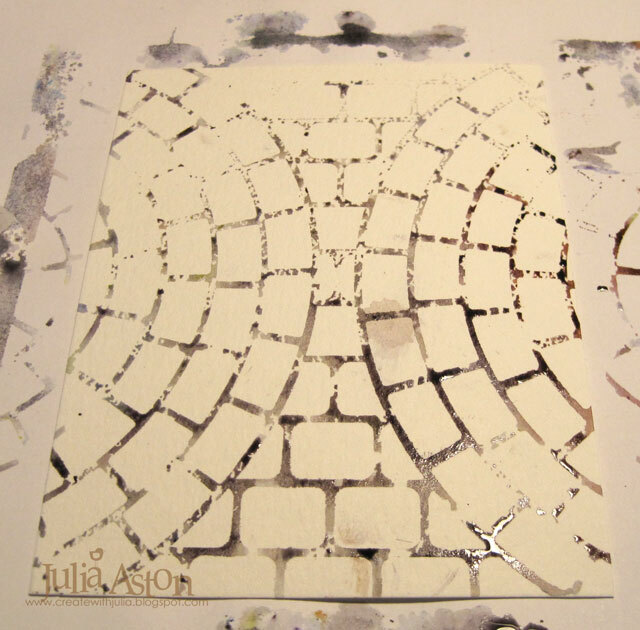 Quickly turn it over on top of a clean panel of water color paper and press over it with a paper towel. Remove the stencil and you will find this negative print. 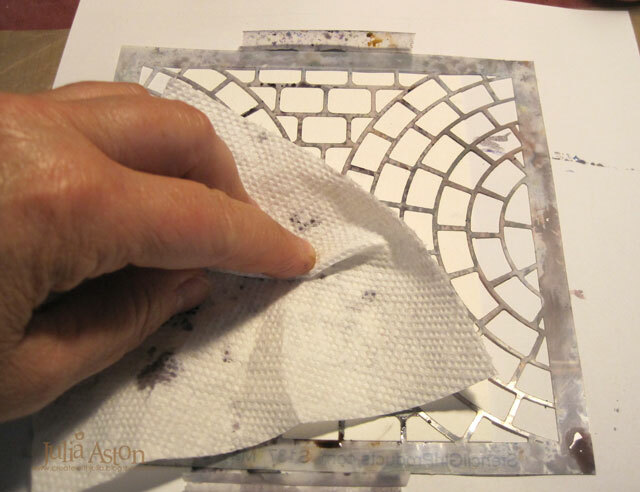 Dry it with your heat tool. 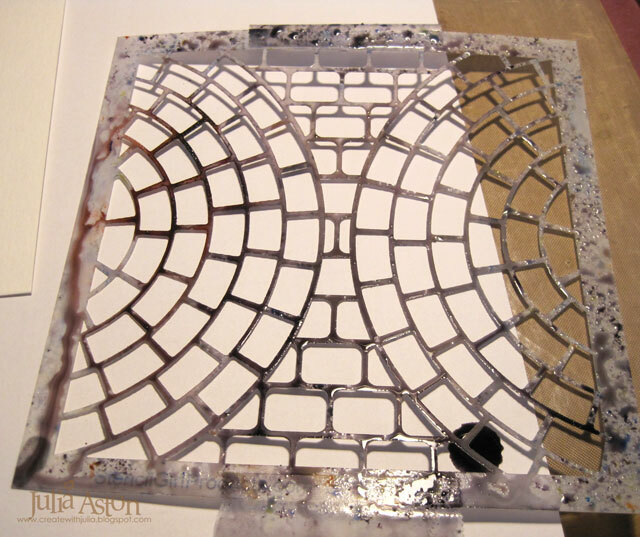 So here is the beginning of the panel I used on my card! I then laid the stencil over this panel matching up the stencil with the lines on the panel. 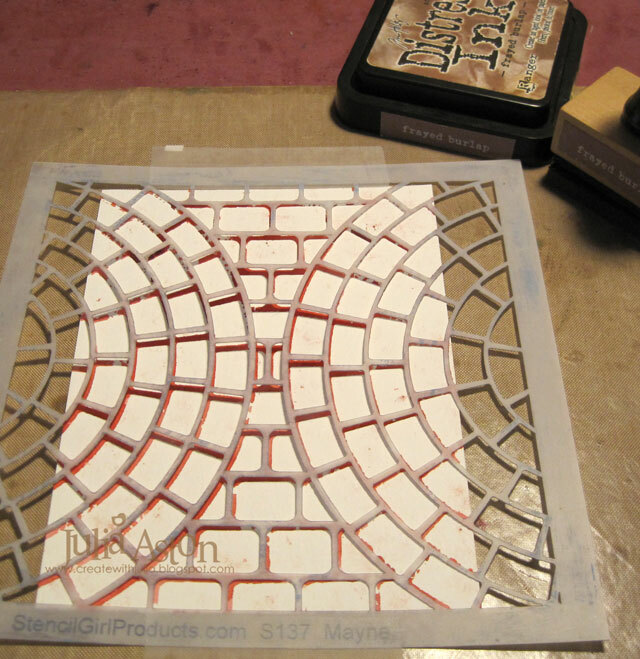 Now it looks like there is just a clean sheet under your stencil. 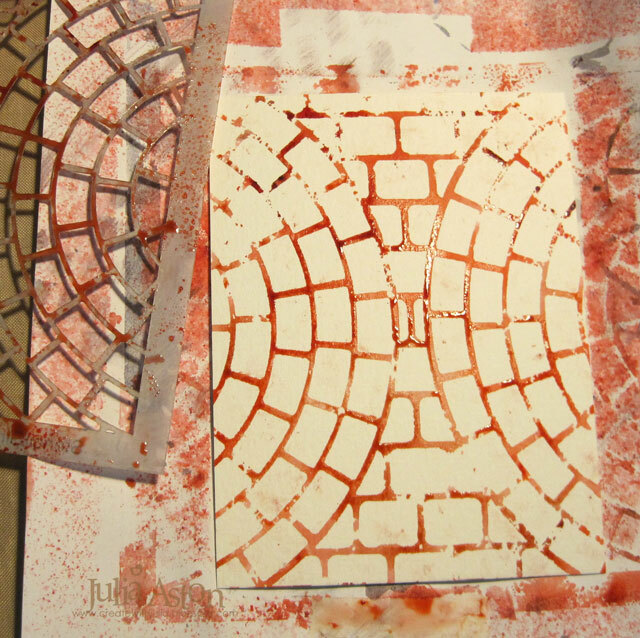 Then I shook Brilliant Red Brushos over the stencil and activated it by spritzing with water. 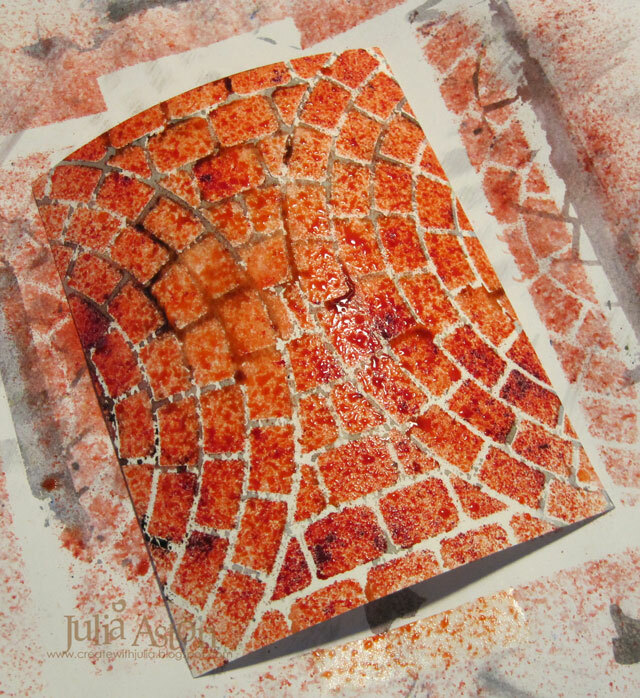 I dried it with my heat tool - and finally - here is the panel I used on my card! 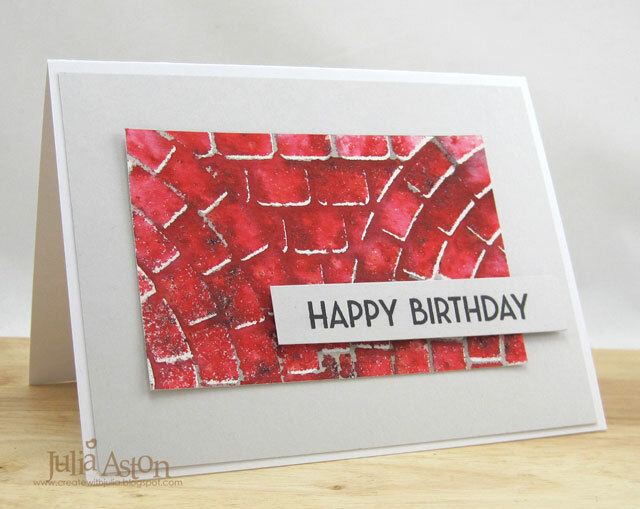 Red brick with grey grout! So just to confuse you more! 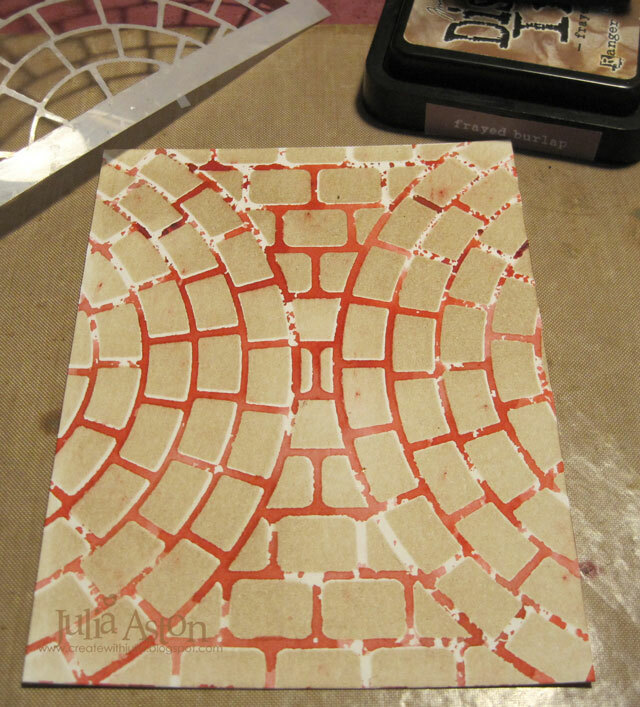 Now you have a stencil with red Brushos on it - that you can flip over and make another negative print! 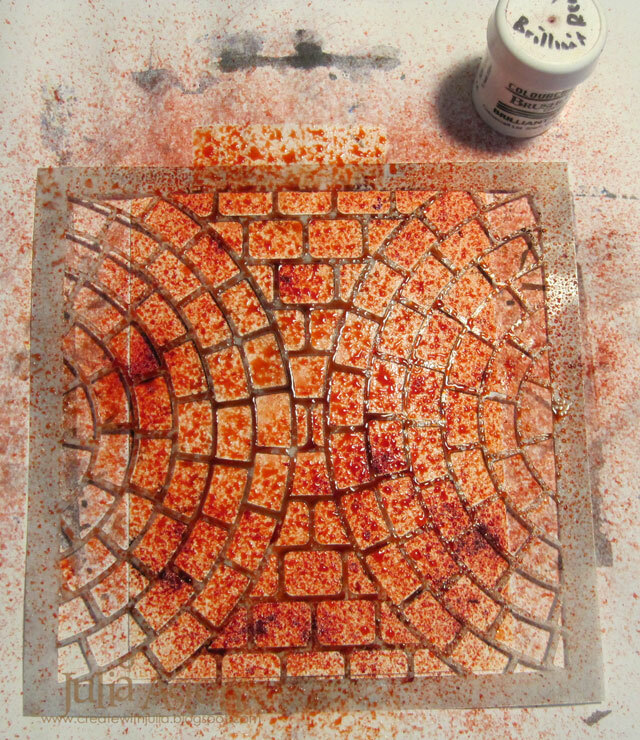 And ended up with this panel (tan brick with red grout!) that I will use on another day. (SORRY! 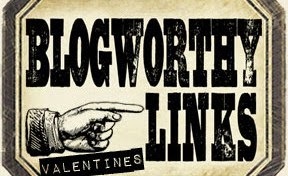 it's been such a long post I'm sure you've forgotten what I made!!?? And since I had cut my panel in half to make this a CAS design - I made a 2nd card and left off the flower die cut to make it masculine. I hope I haven't scared you away - this is really simple - it just takes lots of words to explain! And I'm sure you'll grab all your stencils to see how each one works with this technique! 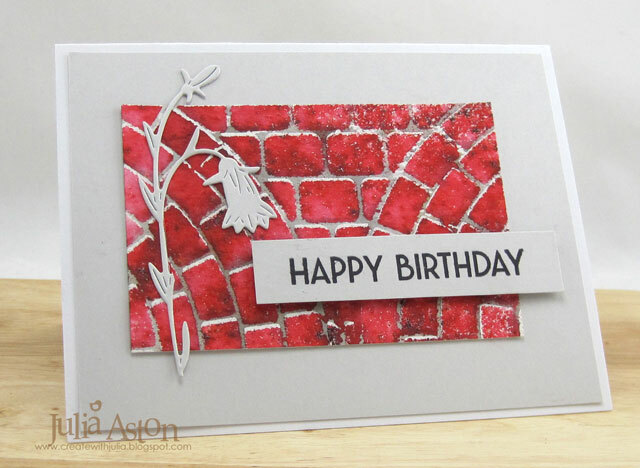 You'll find lots of inspiration from the rest of the Design Team as well as our August Guest Designer: Cathy (Cathy's Card Spot) along with links to several technique videos, over at The CAS Mix Up Blog. 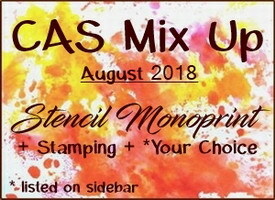 You have until August 24th to link up your CAS Stencil Monoprint card - and I can't wait to see what you do!! 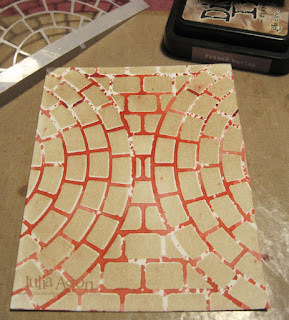 Accessories: Intersecting Brick Circles Stencil - Stencil Girls, Flower Die - Ali Express, Brushos - Gray and Brilliant Red, foam dots, Tombow Glue, water mister. What a fantastic technique, thanks for the clear instructions. Wow! I'm impressed with your success at using Brushos on a stencil, Julia! 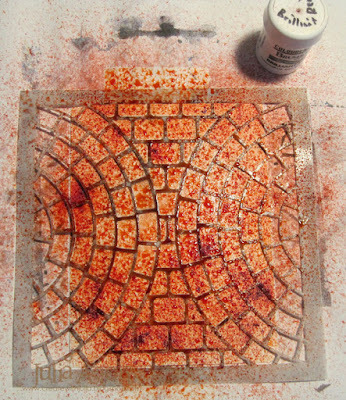 And what fantastic brick images you've created! 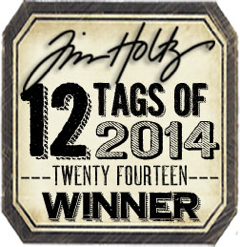 Two fantastic card! 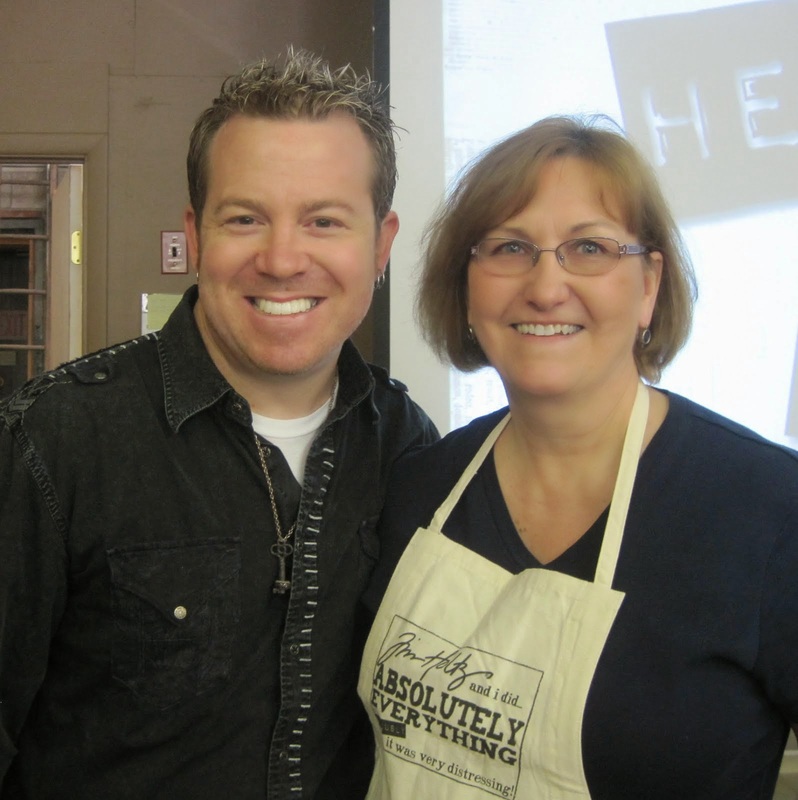 Thanks for the explanation and pictures! 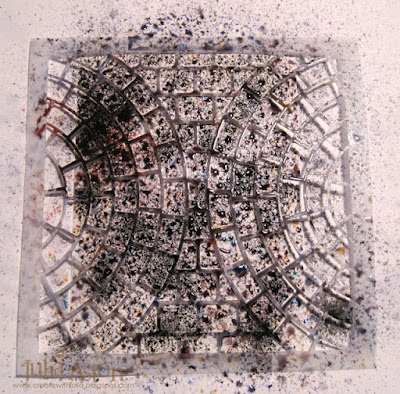 What a wonderful batch of backgrounds you got with your stencil monoprints! The CAS Mix Up card is lovely. 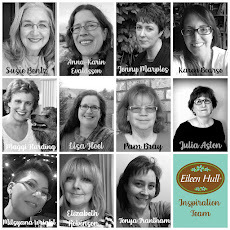 And thank you for the explanation - I love it when bloggers add lots of info! Thank you Julia for the great tutorial on how this amazing piece of art was created. Stunning both cards. Truly brilliant layouts. 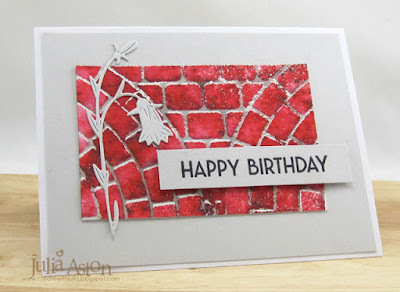 Fabulous stencilling and "printing" to create your brickwork backgrounds - they're so effective. What a great card. 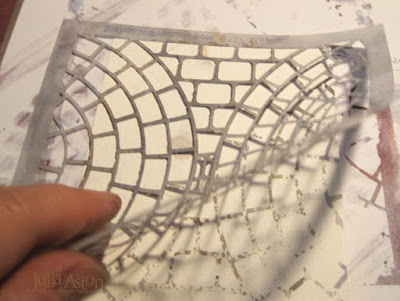 Those are some awesome brick designs -- I love how versatile you have made the different looks. 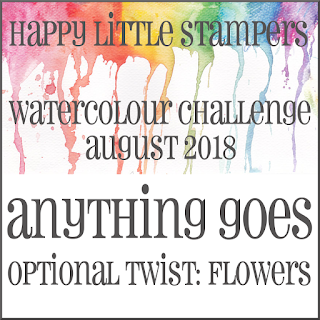 Thank you so much for joining us at Simon Says Stamp Wednesday Challenge -- Good Luck! Thanks so much for the photo tutorial! 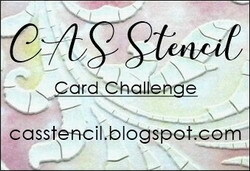 The background you created are fantastic and your cards stunning! Now that I've found where I mislaid my Brushos (! ), I'm casing these cards!!! WOWZER!